It’s no surprise that when parents read to their kids, it helps them succeed in school. Three separate systematic reviews of what educators call dialogic reading—essentially engaging in a conversation with young children as you read to them—found positive effects including improved language skills, literacy, and school readiness. Now a new body of research is finding even more benefits of reading to children—for both the kids and the parents. 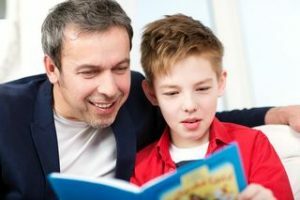 A systematic review published last month in the journal Pediatrics looks at broader benefits of intervention programs designed to encourage parents to read to their children. The reviewers found 18 studies of interventions that included more than 3,200 families. The interventions provided structured training to show parents the best ways to read with their children, and then followed up with the children and parents. The shortest duration was one month and the longest was 48 months. Eleven of the interventions focused on parents with low levels of education and 13 focused on families with a low socioeconomic status. The reviewers found, on the whole, that these reading intervention programs had a significant positive impact on both child and parent psychosocial functioning. Specifically, children showed improvements in social-emotional skills and their interest in reading and reported improve quality of life. And parents experienced better attitudes toward reading, improved relationships with their children and improved parenting skills. The benefits extend to babies and toddlers, as well as children up to age 6 and apply equally to boys and girls. While it’s clear that reading is great for kids, the evidence also shows that some parents need guidance in engaging with kids and books. The Reading Rockets project, sponsored by the U.S. Department of Education, provides some practical tips. Among them, use fun voices for different characters, ask your child questions about the story as you go, and connect what you are reading to real-life experiences whenever possible. If there are any small children in your life, sit down with them for a regular story time. The evidence shows it’s great for kids, and might just benefit you as well!